As far as market rallies go, the one since this past Christmas has been particularly notable for its rapid speed and relative strength. And that’s really about it, which doesn’t inspire much confidence. Since December 24, stocks have rallied 23% – the fastest gain ever reported. However, this rally is happening without the help of some of the biggest sectors, finance and energy, and even typical barometers—including small caps and transports—are lagging. But while the Russell 2000 small cap index is still down more than 10% from its high reached last September, one strategist says that its next move will be critical in terms of where the broader market will go over the next few months. “The Russell is frequently a very good leading indicator for the rest of the stock market, and we certainly saw that last year when it rolled over much earlier than the rest of the market did,” Matt Maley, managing director and equity strategist at Miller Tabak, told CNBC on Tuesday. What concerns Maley is the flattening seen in the Russell recently, and he said that the index is now pushing against its 50-week moving average that it broke below late last year. 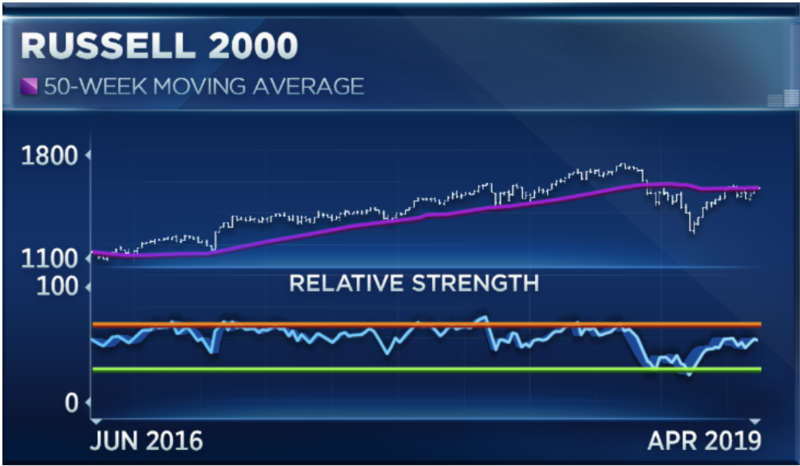 While the 50-week moving average isn’t a common indicator, Maley says that it has been a reliable level of resistance and support in the last few years. Strategic Wealth Partners CEO Mark Tepper believes the Russell could be heading into a downturn, which could portend a difficult road ahead for the broader market. The outcome of the trade talks between the U.S. and China could have a huge impact on large caps as more than 40% of the S&P 500’s revenues come from overseas.